Vacancy in MP Vyapam Recruitment 2018 Apply Online peb.mp.gov.in 5670 Middle School Teacher Posts Jobs Career Notification Advertisement on September 2018 peb.mp.gov.in Career, Latest Job Opening at Madhya Pradesh Professional Examination Board (MP Vyapam) Recruitment 2018 Apply Online Application Form Download, Latest Jobs Notification for 5670 Middle School Teacher Posts Vacancy in MP Vyapam Recruitment 2018. Latest Jobs Career Vacancy in MP Vyapam Recruitment 2018. Madhya Pradesh Professional Examination Board (MP Vyapam) Recruitment 2018 peb.mp.gov.in official website published a new Jobs Circular notification for 5670 Middle School Teacher Posts vacancy on September 2018. Latest Jobs Career Opportunities in MP Vyapam Recruitment 2018. Latest Govt. Jobs in Madhya Pradesh Professional Examination Board (MP Vyapam) 2018 peb.mp.gov.in Career Recruitment news, 5670 Middle School Teacher Posts Vacancy in MP Vyapam Recruitment Notification Apply Online Application Form. MP Vyapam Recruitment News for Middle School Teacher Posts . Eligible candidates may Apply Online from 28th Sept. 2018 to 12th Oct. 2018 (peb.mp.gov.in Career). Further details of Vacancy in MP Vyapam Recruitment 2018 for Middle School Teacher Posts – Age, pay Scale, Eligibility Criteria, How to Apply & other details on Mentioned below. The Professional Examination Board (PEB) is a self-financed, autonomous incorporated body of State Government of Madhya Pradesh. The board was initially set-up as Pre Medical Test Board by Government of Madhya Pradesh in the year 1970. Later, in the year 1981, Pre Engineering Board was constituted. In the year 1982, both these Boards were amalgamated and named as Professional Examination Board (P.E.B.) by Government Order No. 1325-1717-42-82 dated 17.04.1982. Many Job Seekers are waiting for MP Vyapam Recruitment Notification Advertisement 2018 peb.mp.gov.in, Finally your dreams come true, on this week of September 2018 Madhya Pradesh Professional Examination Board (MP Vyapam) published Notification Advertisement for 5670 Middle School Teacher posts , Here You Can Find details Vacancy, Age Limit, Salary & how to apply for this job at MP Vyapam on below. 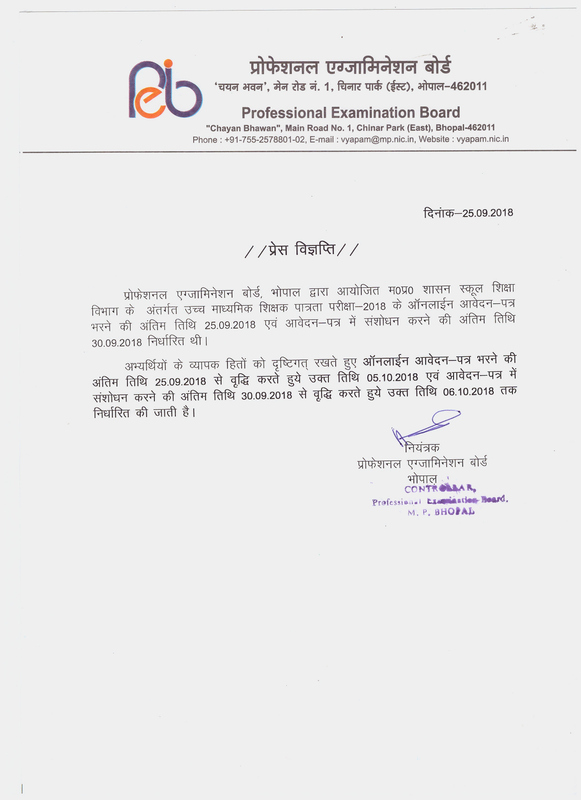 Name of the Recruitment /Organization Authority : Madhya Pradesh Professional Examination Board (MP Vyapam). Name of the Posts : Middle School Teacher. No. of Posts : 5670 Posts. Closing Date of Application: 12th Oct. 2018. Stating Date For Apply Online : 28th Sept. 2018. Closing Date For Apply Online : 12th Oct. 2018. Last date for Correction of Online Application : 17th Oct. 2018. Online Exam Date : 19th Jan. 2018. 1. Middle School Teacher 5670 Rs. 32,800/- + Dearness allowance Per month. Qualification Details For. Middle School Teacher Post : Passed Graduation Degree in relevant Discipline with 02 years Diploma of Primary education. OR Bachelor Degree with a minimum of 50% marks in the subject and 01-year graduate degree in education (B.Ed.). OR Bachelor’s Degree with at least 45% marks in respective subject and in this regard from time to time, the National Teacher Education Council OR Higher Secondary or its equivalent with at least 50% marks and a four-year bachelor (B.L. Ed). OR Higher Secondary or equivalent with the minimum 50% marks and a four year bachelor’s degree in related subjects (BA / B. Sc / B.Ed.). For Above Posts Candidates can apply through online mode. Online application till open 28th Sept. 2018 to 12th Oct. 2018. STEP 1 : Logon to https://peb.mponline.gov.in/Portal/Examinations/Vyapam/examsList.aspx (Apply Online Link). Candidates Can Pay The Fee of Rs. 500/- For General Candidates + MP Online Portal Charge Fees Rs. 70/- Extra and Rs. 250/- For SC/ST + MP Online Portal Charge Fees Rs. 70/- Extra. The Fee Can be submitted through Online. Madhya Pradesh Professional Examination Board (MP Vyapam) 2018, Admit card / Hall ticket can be download from MP Vyapam official website (peb.mp.gov.in) before 10 days for the exam. Details are available on official website. Vacancy in MP Vyapam Recruitment 2018 Apply Online peb.mp.gov.in 17000 High School Teacher Posts Jobs Career Notification Advertisement on September 2018 peb.mp.gov.in Career, Latest Job Opening at Madhya Pradesh Professional Examination Board (MP Vyapam) Recruitment 2018 Apply Online Application Form Download, Latest Jobs Notification for 17000 High School Teacher Posts Vacancy in MP Vyapam Recruitment 2018. Latest Jobs Career Vacancy in MP Vyapam Recruitment 2018. Madhya Pradesh Professional Examination Board (MP Vyapam) Recruitment 2018 peb.mp.gov.in official website published a new Jobs Circular notification for 17000 High School Teacher Posts vacancy on September 2018. Latest Jobs Career Opportunities in MP Vyapam Recruitment 2018. Latest Govt. Jobs in Madhya Pradesh Professional Examination Board (MP Vyapam) 2018 peb.mp.gov.in Career Recruitment news, 17000 High School Teacher Posts Vacancy in MP Vyapam Recruitment Notification Apply Online Application Form. MP Vyapam Recruitment News for High School Teacher Posts . Eligible candidates may Apply Online from 11th Sept. 2018 to 05th Oct. 2018 (peb.mp.gov.in Career). Further details of Vacancy in MP Vyapam Recruitment 2018 for High School Teacher Posts – Age, pay Scale, Eligibility Criteria, How to Apply & other details on Mentioned below. Many Job Seekers are waiting for MP Vyapam Recruitment Notification Advertisement 2018 peb.mp.gov.in, Finally your dreams come true, on this week of September 2018 Madhya Pradesh Professional Examination Board (MP Vyapam) published Notification Advertisement for 17000 High School Teacher posts , Here You Can Find details Vacancy, Age Limit, Salary & how to apply for this job at MP Vyapam on below. Name of the Posts : High School Teacher. No. of Posts : 17000 Posts. Closing Date of Application: 05th Oct. 2018. Closing Date For Apply Online : 05th Oct. 2018. Last Date For Correction of Application Form : 06th Oct. 2018. Exam Date : 29th Dec. 2018. 1. High School Teacher Eligibility Test 2018 17000 Rs. 36200/- per month. UR (Male) 40 years. 49 years. UR (Female) 45 years. 54 years. Reserved Category, SC/ ST/ OBC 54 years. Qualification Details : Passed Post Graduation in relevant Subject with B.Ed. For Above Posts Candidates can apply through online mode. Online application till open 11th Sept. 2018 to 05th Oct. 2018.